Award winning TV news reporter/ presenter. Alison Fan has been a reporter, presenter, columnist, interviewer and producer in both the print and electronic media since 1963. She has been tear gassed during the violent anti-Vietnam protests in California. She has been shot at in San Francisco during the riots between police, students, protesters and the National Guardsmen. Working for a top Californian newspaper in the sixties and early seventies…she covered the transition from Haight-Ashbury hippies, through the rise of the Black Panthers…the fatal confrontation between the Black Panthers and the Rolling Stones…the historic Woodstock Festival…with personal interviews with stars like Jimi Hendrix. Alison has spent more than 35 years reporting for Channel 7 Perth for both Channel 7 News and Today Tonight. She has also been an interviewer/panelist for Channel 7’s Telethon since its inception. She has been a columnist for the Weekend News, Oakland Tribune California, and Perth Weekly. She was newsreader for Channel 7 News from 1978 to 1991, and is currently one of the most senior and experienced female television news reporters in Australia today. Alison has covered every major court trial in W.A. since 1965. She covered the Costigan (Bottom of the Harbour) Royal Commission in the early 1980s…did daily and nightly live reports from the W.A. Inc. Royal Commission from 1991 to 1992, and was a key witness in the Carmen Lawrence-Easton Royal Commission. She has covered the rise and fall of Alan Bond, Dallas Dempster, Laurie Connell and Robert Holmes a Court…the trials and jailing of former Premier Brian Burke, Premier Ray O’Connor and Deputy Premier David Parker. She covered the horrendous serial killings by David and Catherine Birnie….one of the victims was a schoolmate of Alison’s son. She has also covered the Claremont serial killings in the nineties – speaking to the victim’s families and also a number of suspects. In 1989 Alison gained national and international recognition when a million dollars worth of gold was sent to her personally at Channel 7. This was following more than a decade of stories she’d done on the controversial conviction and jailing of the Mickelberg brothers for the Perth Mint Swindle. Also in 1989 Alison had an unwelcome encounter with Breast Cancer. Since then she has featured in a number of women’s magazines, daily newspapers, TV programs and in on-going campaigns to encourage women to have regular mammograms and check ups. In recent years a man wanted by police for holding his female lawyer and her husband hostage at gunpoint, and threatening to kill her, gave himself up to Alison at Channel 7 after being on the run from police for several days. 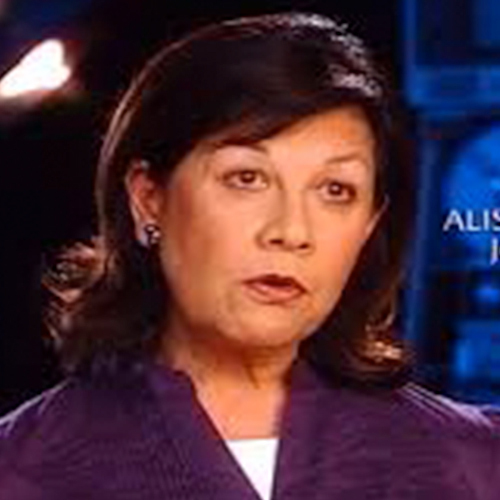 Alison has won numerous awards during her career including Thorn EMI Award for TV News (Mickelberg Gold story), AJA Journalist of the Year Award, Perth Press Club Award and Daily News Centenary Prize (Best of All Winners), National winner for Excellence in Journalism – MBF Awards, State winner of MBF Health Award for a report on prostate cancer. Alison is also an entertaining and inspiring speaker as well as first class master of ceremonies.